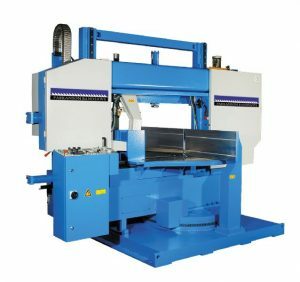 Fully automatic twin column CNC feeding and mitring bandsaw for cutting beams, pipes and solids. – For cutting variable angles from 60 degrees left to 45 degrees right. – Twin columns with leaner guide ways for cutting with greater stability and accuracy. – Inclination of the saw blade (5 degrees) to reduce the initial blade impact when cutting beams and square tubes. – The NC control allows setting and memorising 250 cutting programs with different cutting lengths, quantities and angles. – Automatic positioning of guide arm.